Biotechnology is the science and technology based on life science. Biotechnology connects cellular and molecular processes to develop technologies and products that help to improve quality of life. Recent advances in biotechnology helps in developing tools and technologies to combat deadly diseases, to keep the environment healthier and to have efficient industrial manufacturing processes. School of Life Sciences, B. S. Abdur Rahman University is offering B. Tech. in Biotechnology commencing from 2014. The course will train the students in theory and laboratory techniques of national and international importance. The program provides a firm foundation in the principles underlying modern biotechnology techniques, and integrates this theoretical understanding with intensive training in a variety of laboratory skills and in computer applications to biotechnology. All the mentors and the faculties in the School are highly competent and committed with specializations in diverse fields of genetics, cell and molecular biology, biochemistry, microbiology, bioinformatics etc. All the faculty members are trained in universities and research laboratories of international and national excellence. All of them intend to conduct high quality research along with classroom teaching. Seminars, conferences and workshops at local, national and international levels will be organized to expose the students to the global trends in biotechnology. To supplement the academic input of students by way of seminars, conferences, guest lectures and industrial visits. To strive constantly so as to improve the quality of the faculty members through up-gradation of qualification, participation in, and conduction of short term training programs, seminars and workshops, and publications of papers, books etc. 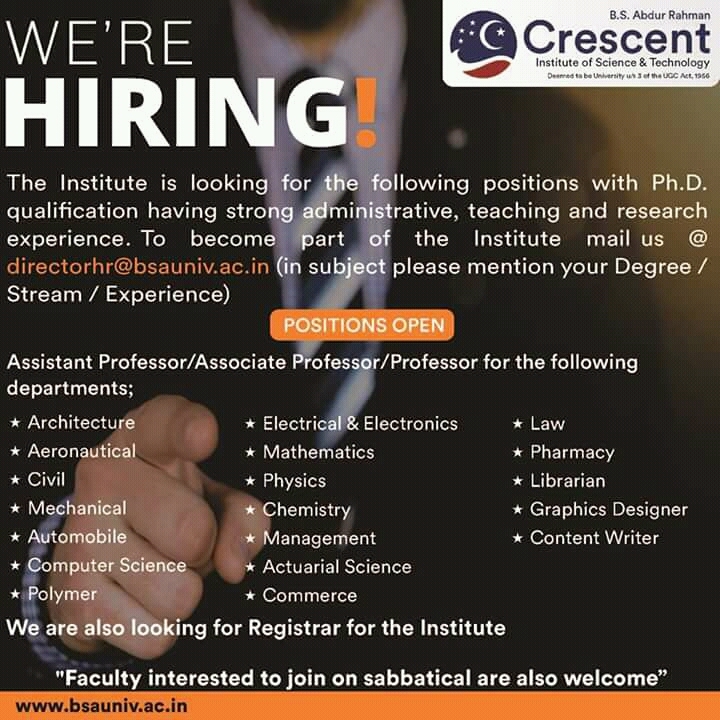 To provide industrial exposure to the faculty members by undertaking sponsored research, consultancy work and organizing industry oriented training programs at various levels. Employment record shows that biotechnology has a great scope in future. Bio-technologists can find careers with pharmaceutical companies, chemical, agriculture and allied industries. They can be employed in the areas of planning, production and management of bio-processing industries. As there is increasing popularity and explosive growth, there are plenty of opportunities available in Biotechnology field. Cancer is one of the major health problems with high mortality rate. Progression from normal cell to cancer cell is not only complex but also multi scale process mainly caused by alterations of the genome and proteome that allow the cancer cell to evade normal cellular control mechanisms towards uncontrolled growth. According to a recent survey by World Health Organization (WHO), each year 15- 16 million new cancer cases emerges in the global population and about 1 million new cancer cases are diagnosed in India every year. Biotechnology research is one of the many fields working to develop treatment and cures for this disease. The field of cancer biotechnology merges technology with cancer cell biology in developing new products and tools to combat with this deadly disease. A four year undergraduate program (B.Tech) in Cancer Biotechnology is introduced with the major aim of in-depth understanding of cancer and to utilize this knowledge to develop more effective diagnostic treatment and prevention regimens. The major focus will be to educate students about the development of new medicines and treatment approaches using technology to understand carcinogenesis in a better way. The course will train the students in theory and laboratory techniques of national and international importance. The program provides a firm foundation in the principles underlying modern biotechnology techniques, and integrates this theoretical understanding with intensive training in a variety of laboratory skills and in computer applications in the field of cancer study. All the mentors and the faculties in the School are highly competent and committed with specializations in diverse fields of genetics, cell and molecular biology, biochemistry, microbiology, bioinformatics etc related to cancer research. All the faculty members are trained in universities and research laboratories of international and national excellence. All of them intend to conduct high quality research along with classroom teaching. Seminars, conferences and workshops at local, national and international levels will be organized to expose the students to the global trends in cancer research. This course aims to attract students interested in tumor biology who wish to pursue a career either in industry (biotechnology) or academia. Considering the complexity and diversity of cancers there is increased demand of highly trained cancer biologist or oncologists at clinical, institutional and industrial sectors both in India and abroad. Employment record shows that a specialization in cancer study has a great scope in future. Cancer specialists can find careers with pharmaceutical companies and allied industries. As there is increasing popularity and explosive growth, there are plenty of opportunities available in cancer biotechnology field. B. Tech in Food Biotechnology offers with a preface to the fascinating field of biotechnology and its functions in the world of food industry. This course has a strong background in the core sciences of chemistry and biochemistry, alongside the processing of food, which has been recognized as a very potent sector for both industry and academia. The course covers on topics related to food process technology, food packaging technology, industrial management, probiotics engineering, food flavoring technology, food-borne pathogen detection techniques, food engineering laws and regulations. This course raises issues at the forefront of modern food production and will cover the origins of biotechnology and social issues related to the implications of biotechnology in food industry. At the end of this course the graduates will also have a chance to challenge the myths associated with food allergies and the risks, causes and solutions. School of Life Sciences, B. S. Abdur Rahman University is offering B. Tech. in Food Biotechnology commencing from 2014. The course will train the students in theory and laboratory techniques of national and international importance. The program provides a firm foundation in the principles underlying modern food biotechnology techniques, and integrates this theoretical understanding with intensive training in a variety of laboratory skills and in computer applications to food biotechnology. All the mentors and the faculties in the School are highly competent and committed with specializations in diverse fields of genetics, cell and molecular biology, biochemistry, microbiology, bioinformatics related to food biotechnology etc. All the faculty members are trained in universities and research laboratories of international and national excellence. All of them intend to conduct high quality research along with classroom teaching. Seminars, conferences and workshops at local, national and international levels will be organized to expose the students to the global trends in food biotechnology. Apart from basics food biotechnology, this course modules includes: Food Chemistry, Food process technology, Food preservation technologies, Food Packaging Technology, Industrial Management, Food Plant Layout /Design, Food Analysis /Quality Control, Probiotics Engineering, Food flavoring Technology, Dairy food technology, Bioreactor Design and Analysis, Nanobiotechnology, Intellectual Property Rights & Patents, Computational Biology, Biostatistics, Law for Engineers and Communication cleverness courses. There are numerous opportunities inside the food industry from jobs in nutrition and new product development to roles in the supply chain, purchasing, logistics and distribution. A graduate may decide to become a development scientist working on new foodstuffs and producing food which is safe and nutritious with a consistent flavor, color and texture. There are employment opportunities not only in industrial and academic sectors but also in national and state government or government authorized food inspection departments. Other job opportunities includes the position of industrial buyer, retail buyer, production manager or quality assurance manager.